Dr. Nandi is a well known physician in both the US and India, where he grew up. Catherine Grace O’Connell, LA Based Fashion/Lifestyle Influencer. Founder of Forever Fierce: The Midlife Revolution, Radio Host Cat & Kaehler, LA Talk Radio. Dr. Nandi is a well known physician in both the US and India, where he grew up. As a young boy, Dr. Nandi was diagnosed with Rheumatic Fever that was life threatening. His joints ached and his heart was impacted while his caring parents searched for answers in both Eastern and Western medicine. Dr. Nandi’s gift lies in straddling these two worlds and empowering his patients with information. He’s an advocate of people becoming their own #HealthHero as he and his family had to do long ago. His latest book, Ask Dr. Nandi, is launching today and it’s a must read packed with vital information to help you improve your health on every level. Believing that disease begins on the inside, Dr. Nandi offers brilliant yet simple lifestyle and nutrition changes to fuel your genes and power up your immune system. 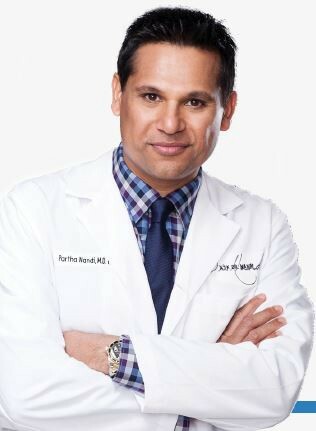 With his popular TV Show, “Ask Dr. Nandi,” airing to over 95 million households, this doctor is on fire to empower men and women everywhere to begin taking control of their own health. Welcome, Dr. Nandi! CGO: Dr. Nandi, I love the concept of becoming your own Health Hero. What does it mean to be a Health Hero? DN: Being a #HealthHero is about taking control of your health and making conscious choices that empower you to live your best life. It’s being mindful of how you nourish your body, your soul, your relationships. It’s making small, realistic changes to your daily routine that have huge impacts on your life. The moment you recognize that your health is your top priority and you start to implement important life changes is the exact moment you start to become your own #HealthHero. You just have to be willing to jump into that driver’s seat and take control. CGO: You sure do! You stress the importance of finding your tribe. Why is having a supportive community such a vital part of our well being? DN: Your #tribe is made up of the people you love — and are loved by — the most. These are the people who understand, respect and support you. Because the relationships are genuine, you can experience life with your tribe — real life, with all of its ups and downs — and remain a strong, supportive unit. It’s this sense of community that can significantly improve your life. It’s like having a built-in cheering squad. That support does wonders for your physical and psychological health. It helps keep depression away, improves your mindset and increases your overall happiness. It gives you purpose and empowers you to grow into a stronger, better version of yourself. You become happier and healthier. In fact, those in long-term relationships actually live longer! It’s all about being part of a community with a strong bond. CGO: Yes, a sense of connection is an important component of healing. Dr. Nandi, I’m a big proponent of Integrative Medicine, having healed my own life threatening illness through alternative means. Why is it so important to be open to both the Eastern and Western approaches to healing? DN: My life experience has blessed me with the insight to embrace the best of both Eastern and Western philosophy. I grew up with alternative medicine, prayer and meditation, acupuncture and other practices taught in my home. My parents instilled in me a strong pride and respect for my culture and cultures around the world. They supported me having more than one belief system. When I came to the U.S., I learned the beauty of the West as well. I had one foot in each culture. Once I was old enough to carry the weight of both Eastern and Western cultures, that’s when I could really fly. That’s when I could take advantage of the very best each has to offer. We’re all unique. What heals one might not heal another. When we’re open to both healing approaches, we have more tools at our disposal and become more likely to find the approach that gives us the greatest chance for healing based on what our body needs. CGO: It’s important to be open to the best of both worlds. You offer some very simple solutions to a wide range of health challenges in your book. What are some of these solutions you share with your patients who are struggling with weight loss and the endless diet solutions? DN: Good nutrition isn’t the result of an act — it’s the result of living in the habit of good nutrition. There are no shortcuts. It comes down to simple steps that are realistic and sustainable. Stick to a plant-based diet as much as possible. Implement the 2/3 rule (eating until you’re 2/3 full) and the 80/20 rule (healthy eating 80% of the time, less restricted 20% of the time). These are realistic goals that make it easy to maintain a healthy weight long-term. You can’t lose and keep weight off with diet alone, so you need to implement purposeful movement every day. An active lifestyle and good nutrition will get you where you need to be. CGO: Nutrition is a vital cornerstone of the healing process. As an MD, you operate from a space of compassion and caring which can be few and far between in the world of medicine. Do you feel that doctors often misdiagnose illnesses because they haven’t spent the time to listen to their patients? DN: That does happen. But, I feel that many caregivers do not know about all of the tools that are available outside of their training in Western medicine. These are the exact tools that I describe in my book, Ask Dr. Nandi. CGO: And we do need those! In your book, you share a secret to increasing your longevity by over 7 years by making one simple change in your lifestyle. What small change can people make in their daily routines to improve their health? DN: Many people assume that to really make a difference, they have to make monumental changes. They think the road to better health and longevity will feel like a full-time job and don’t see why they should even bother. What I want people to know is that it doesn’t have to be complicated and overwhelming. There are simple shifts that they can make to transform their lives long-term. The key is implementing small, manageable changes that are realistic and sustainable. That’s where you start. You start small. Devoting even 5 minutes a day to purposeful movement, meditation, healthy nutrition, etc. will change your numbers and your outcome. Start with one thing that you spend a few minutes on each day, and you’ll see results. Then, motivation kicks in and your mind will be strong enough to take that leap and implement these small changes on a regular basis. Take 5 minutes in the morning to stretch or meditate. Commit to taking a short walk out in the fresh air once a week. Try a healthy new recipe once a week. It’s about going back to basics, starting small and adding on from there. That’s when people get big results and help the root cause of their diseases and illnesses. CGO: That’s great advice. Keep it simple and easy. In your practice, what do you see as common patterns and behaviors that lead to illness and what can people do to change them? DN: Today’s world is one with more chronic illness and disease. I see a pattern of people not taking care of themselves. Instead of following simple and logical advice, they’re looking for a shortcut. A quick fix. They wind up chasing their tails and treating their symptoms instead of the issues causing their symptoms. For example, a diabetic who wants to stop feeling tired but doesn’t address the root cause. This person would have to look closely at their diet, activity, etc. You need to look at the long-game in order to achieve sustainable success. There are simple shifts that you can make to change your life. You don’t have to be overwhelmed with monumental changes. When you make the choice to implement these small, easy changes — you get big results and help the root cause of your diseases and illnesses. Of course, when needed, the help of modern medicines can also help you get to where you need to be in your life. CGO: It sounds like a series of small changes can add up to a much larger result. You’re a big proponent of meditation. Coming from India, I imagine this had a powerful impact on your healing. We live in a very stressed out world that results in high cortisol levels and adrenal burnout. Why is it so important to incorporate a personal meditation practice? DN: Stress is a silent killer that adversely affects everyone. Now more than ever, it’s crucial to make stress reduction practices part of your daily routine. I love recommending meditation. It’s one of my favorite self-care practices. It offers life-changing benefits and is one of the best natural stress-busters out there. Cultivating your mind through meditation can actually change how your DNA responds to stress. Meditation and yoga have been shown to decrease depression and anxiety. When you practice regularly, you increase your chances for lower blood pressure, improved cardiovascular health, better pulmonary function, lower blood sugar, boosted immunity and more happiness! Think of it as a spiritual workout for your soul. You can start small. Devote even 5 minutes a day to meditating, and you’ll change your health outcome. That’s all it takes! And for anyone who’s on the fence, remember that you don’t need fancy equipment. You don’t have to be religious. No matter your background, you can enjoy the practice and reap the benefits. CGO: I love meditation. It’s been life changing for me. You talk about the 5 pillars to becoming your own Health Hero and advocate. What are the core pillars of your program? DN: The five pillars are nutrition, purpose, movement, mindfulness and tribe. When you incorporate each of them into your daily routine, you create a life path that promotes physical health, mental health and cultivation of the soul. The pillars come from my life-long study of Western and Eastern medicine, my patients and my own tribe and family. There are multiple sources of research that back up these pillars and how significantly they affect our lives. I use them in all areas of my life, from how I handle my own experiences to the lives of my patients and family. By choosing to prioritize these pillars, we take charge of our health and live our best lives. Making even small, sustainable changes gets big results — like experiencing more joy, a greater sense of fulfillment, deeper relationships, increased energy and strength and more passion for life! We become empowered to live healthier by nourishing our bodies and well as our souls. CGO: That’s a critical foundation for health. You talk a lot about the stress that people are under and the impact on their health. What can we do to strengthen our immune systems and reduce our stress levels outside of meditation? DN: Your nutritional choices play a huge part in your overall health. It’s crucial to nourish your body with whole, natural and healthy foods. Food is powerful medicine. There are foods that can fight off depression, boost your mood, strengthen your immune system and even help prevent cancer and other illnesses. When you use food as medicine, you combat stress and protect yourself from the dangerous effects. Making simple and sustainable nutritional choices is easy, it’s fun and it leads to a healthier and longer life. CGO: Yes, food is medicine, truly. What’s the most amazing recovery you have ever witnessed personally with your patients? DN: I have a patient who beat 6 cancers! I write about him in my new book. He utilized purpose — one of the 5 pillars — in defeating his enemy … cancer. He describes his journey as “me against cancer.” He utilized all that Western medicine had to offer as well as his sense of purpose and drive. Simply amazing! CGO: I remember reading that story. It was brilliant! There are endless studies on the correlation between nutrition and brain function. There are a lot of new studies out sharing the incredible ability of the brain to regenerate through neuroplasticity. What can the average person do on a regular basis to fuel their brain and to build healthy neural pathways? DN: The first thing they can do is to have purpose. With purpose comes great mental health. Sleep is also critical. Sleep is brain food! Finally, eating fruits and veggies with amazing color, vibrance and antioxidants can be critical! CGO: Ah, yes, the importance of sleep. Lyme Disease is very close to my heart having survived an NDE not long ago. Most doctors are very confused when it comes to treating Lyme Disease. What’s your perspective on this illness and how do you treat a typical patient with advanced Lyme Disease that has crossed the blood brain barrier? DN: Lyme Disease is still very misunderstood by many both within and outside of the medical community. Funding, awareness and education is desperately needed. This disease presents in so many ways and mimics many other illnesses. That’s why it’s known as The Great Imitator. Not surprisingly, this can make getting a timely and accurate diagnosis a huge challenge. Inaccurate testing methods add to that challenge, which puts patients at greater risk. When caught and treated early, a full recovery can be made. But when patients become chronic or reach advanced stages, treatment becomes much more complicated. Until we have accurate testing and better treatment options, it’s difficult to determine which treatment is best. What works for some doesn’t necessarily work for others. The whole person has to be considered. It’s much more than simply putting someone on antibiotics. While that is typically needed, other things should also factor in when determining treatment. For advanced cases, medications that can break through the blood brain barrier, access the bacteria and kill them off must be considered. My hope is that we quickly come to better understand this disease so that we can diagnose more quickly and treat more effectively. CGO: You’re very wise when it comes to this illness. You emphasize the importance of finding a purpose. Why does passion and purpose help us in our healing process? DN: Purpose is a fundamental part of everyone’s well-being. A strong sense of purpose can actually help us to heal and extend our lifespan. It gives us access to hope, resiliency and motivation. We need to ask ourselves how we can find meaning and purpose in life and use that to create healthy habits for mind and body. My new book provides the tools that empower you to strengthen your sense of purpose and direction in life. CGO: I’ve found that connecting to purpose has been key to my healing.There is a lot of new information out that dispels the myth that our genes control our destiny. What have you discovered that has helped your patients to heal and overcome any genetic limitations? DN: These new findings have created a power shift where people can change their destiny. You’re not doomed to suffer because a certain disease runs in your family. Mind-body practices like meditation and yoga offer amazing benefits that actually begin on the cellular level. They give you the ability and power to change your gene expression. They actually change how your DNA responds to stress! This means that meditation and yoga don’t simply relax you, but might actually reverse molecular reactions to stress in your DNA that can lead to poor health, disease and depression. CGO: Meditation is powerful! In your experience, is a person’s faith and belief system paramount to their overcoming a life threatening illness? DN: Yes! Spirituality is key in fighting disease and illness. Every disease is treated more effectively when spirituality is present. CGO: The book, “Dying to be Me” by Anita Moorjani tells a story of an NDE where she was healed of an extreme case of cancer that was incurable by experiencing the power of love when she traveled to the other side. As an Integrative MD who is open to many mystical practices, what do you attribute her miraculous healing? Is it possible for the average person to heal by tapping into the power of love on earth? DN: While every person and every case is different, cells in our body have the power to heal themselves. Spirituality plays a huge role in this healing and unlocking the power of the human body! CGO: Thank you, Dr. Nandi for being here today. Your book is a true Godsend. Dr. Nandi can be found on his website Ask Dr. Nandi, and on Twitter, Facebook, and Instagram. You can find Catherine Grace O’Connell on her blog at CatherineGraceO. She is also on Facebook, Instagram, and Twitter as @catherinegraceo. Tune in to Cat & Kaehler: Fiercely Empowering Women of All Ages Through the Lens of Midlife with Catherine and co-host Kathy Kaehler live every Tuesday at 2 PM EST/11 AM PST or download as a podcast on LA TalkRadio, iTunes, Stitcher, and Google Play Music. You can find out more about Forever Fierce: The Midlife Revolution and how to join us by sending an email to [email protected].